Think bigger—we've got you covered. With up to 48TB of capacity on your desktop, up to 2600MB/s speeds, and RAID 5/6, the LaCie 12big Thunderbolt 3 lets you rein in the stampede of data from ultra hi–res cameras. 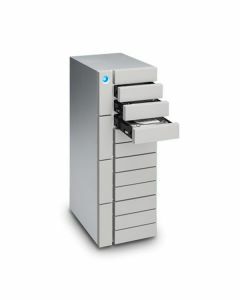 LaCie’s 12big surpasses what the market has come to expect from enterprise class storage by aiming for, and achieving, a ground breaking redesign. A mechanised overhaul sets new benchmarks for consistency and adaptability. The LaCie 12big also provides premium performance thanks to Thunderbolt 3 technology and RAID hardware, and 48TB of storage. It’s no longer that case that an interface is the debarring factor in a storage solution’s speed, thanks to Thunderbolt 3 technology. LaCie have succeeded in pressing the absolute best speeds out of its hard disks because the 12big capitalises on the Thunderbolt 3 I/O’s breakthrough performance potential. Continuous speeds of up to 2600 MB/s, capable of turbocharging file transfers and backups, are possible with the simple hardware additions of a RAID controller and 7200 RPM disks. The unit can run RAID 0, 1, 5, 6, 10 or 50. A Digital photographer can enjoy seamless perusal of a massive RAW photo library with zero lag. Videographers re empowered to edit multiple 2K uncompressed 10-bit streams, or play back compressed 4K video with this kind of speed. Daisy chaining higher-resolution displays, like 4K monitors, is also now a possibility. The LaCie 12big achieves top-line speeds on any late-model PC or Mac with USB-C and Thunderbolt 3 interfaces. USB 3.0 backward compatibility makes it possible to connect the LaCie 12big to any standard PC. You can seamlessly connect to both PC and Mac computers without losing your RAID configuration, with support for exFAT and built-in hardware RAID. Whatever your workstation, move mountains of data – fast. Included LaCie Private-Public software also enables AES 256-bit encryption to password-protect volumes.